Thermal deburring machines use intense bursts of heat to burn up burrs and flash for a smooth finish. 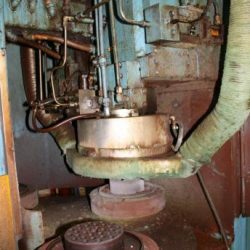 Rather than hand deburring or smoothing, the combustion process eliminates all burrs on a piece at once, even in blind holes and internal surfaces. 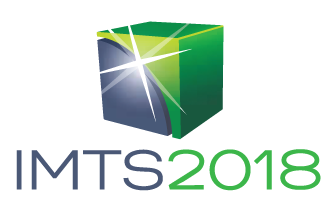 The primary advantage of thermal deburring over other deburring methods is its single-pass removall of ALL undesirable material from a part--inside and out. Even places inaccessible to hand deburring such as blind or intersecting holes are included in the process. Since thermal deburring is highly repeatable and consistent, it eliminates the need for follow-up inspection of parts. Since the combustion completely surrounds the piece, there is no need for inspection even if burr locations change during a production run. 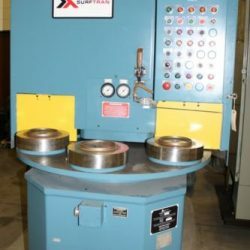 As long as the part to be deburred has a proper oxidation threshold, thermal deburring works on a wide range of materials and requires little or no changeover time for differing parts. The high-volume reliable nature of the process significantly reduces cost per part and eliminates most of the warranty cost from other, less effective deburring methods. For answers to your questions or more information on thermal deburring machines call Liberty at 847-276-2761 or send us an email sales@libertymachinery.com. Liberty Machinery buys and sells more thermal deburring machines than any other used machinery dealer. 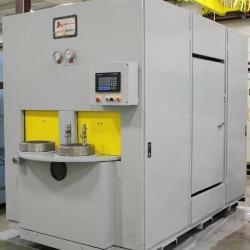 We are your #1 source for high quality thermal deburring machines. 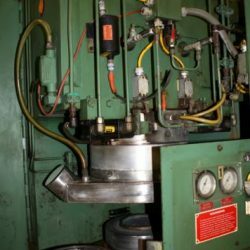 The goal of a thermal deburring machine is to completely burn up all burrs and flash on all parts within the combustion chamber. The machine may be broken down into several components: the explosion chamber, the plate, and the combustible gases and their mixing and piping mechanisms. The part to be deburred is placed on a plate that is sealed to prevent gas from escaping. This plate may be fixed on a rotating table with several stations. As the plate enters the explosion chamber, the machine fills the chamber with a customizable mixture of oxygen and gas. This gas completely saturates the chamber, and a spark plug ignites it. The gas totally combusts within 20 milliseconds, turning the burrs into oxide powder but leaving the main body of the part unharmed due to its higher ignition point. Temperatures can reach 5972ºF. Due to this incredibly quick oxidation speed, burrs are removed without changing the parts either dimensionally or metallurgically. Complete cycle time can take less than 2 minutes. There will be a coating of oxide powder on the part which must then be cleaned away with a solvent. Thermal deburring does not work on very thin or fragile parts, parts larger than the explosion chamber, or materials with extreme oxidation resistance. 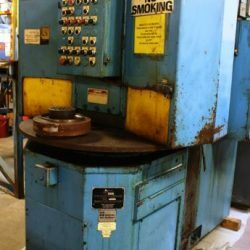 Liberty is always looking for used thermal deburring machines to buy for inventory. Contact us and let us know what you have for sale. We’ll be happy to give you a free quote. 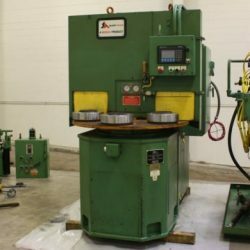 See our used Thermal Deburring Machines for sale. Surf/Tran Bosch Group. Form No. L-030 (Madison, WI: Robert Bosch Corporation, 1994). Ina Sophie Kramer, Thermal Deburring. (Luhden, Germany: ATL Anlagentechnik Luhden GmbH, 2014), 5.